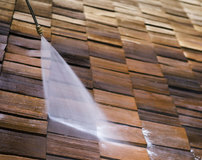 We offer roof cleaning and deck cleaning througout Seattle, Renton, Tacoma and the Eastside. Whether you're dealing with moss on your roof or mildew on your deck, our pressure washing and power washing services remove moss, mildew, lichen, and algae. We're the cure for slippery decks! We offer a preventative maintenance service. 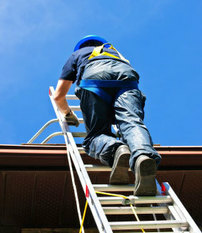 After the leaves have fallen, we will gently air clean the roof and clean your gutters. This will leave fewer nutrients on which the moss grows, and allow for better drainage from your roof to the foundation/footing drain. A composition roof is made up of solidified tar with a gravel protective coating. This protects against UV rays from the sun. Moss will get between the shingles and migrate underneath, deforming the asphalt shingles and causing the shingles to fracture. Removal will reduce premature decomposition. Once the moss has gotten underneath, it can cause the shingles to warp and buckle. At that point, the roof may need to be replaced. Tile Roofs - Although moss and algae will not deteriorate a tile roof as easily as it will a composite or shake roof, the build-up of moss can hinder water run-off. It can dam up and force the water to go underneath the tiles. 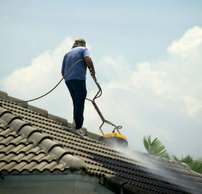 Occasionally, our Roof Cleaner will realize that you may need minor roof repair. This can extend the life of your roof. We can do this for an additional charge. If the damage is extensive, we will consult with you about the option of replacing the entire roof. We clean all debris from your gutters so that water can flow freely to the downspouts. If the gutters overflow, it can damage the facia board of your home. Moisture can wick to the underlaminate of the roof and cause dryrot. We wash the mildew and algae from the outside, the bottom and the front face of the gutter. This not only makes them “look nice” but will reduce premature aging. 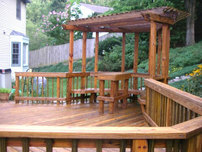 After your deck or Patio is cleaned, we can apply a wood preservative with (or without) a stain. We use what we believe is to be the finest product. 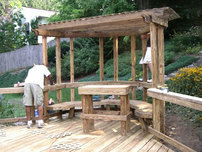 It will penetrate into the wood to: repel water, stop UV Damage, reduce wood rot, and reduce mold and mildew growth. Most steps are wood or concrete. For safety reasons, in addition to appearance, it is important have these periodically cleaned. We remove all debris, moss and fungal growth that can make the steps slippery and unsafe. 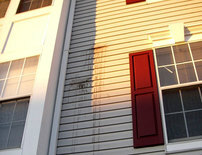 Mildew/mold on siding appears as a dark spot, often on a shady side of your home. It likes humidity, and can be a sign of underlying moisture issues in your home. You will know if there is mildew on your siding if you apply a drop of chlorine bleach and if the siding immediately lightens in color. (But, do it in the corner or an inconspicuous place.) Once mold develops, washing the surface with a oxygenated bleach solution usually removes the mildew. Be certain to remove all mildew prior to painting because it will either bore further into the siding, or in to the paint. If the thin layer of dirt and pollution is not first removed, the fresh paint will not bond to the material surfaces. We will rinse large pieces off windows at no charge. Generally, windows will need to be cleaned of water marks to complete your house cleaning. We can refer you to a company for this work. Unless directed otherwise, we the moss from the roof will be rinsed into the grass or garden. Generally, it is not a problem at all. It should not be noticeable or cause any damage. If you want us to put this into a “green” trash can, there is an extra charge. It is often easiest to call with questions or to schedule an appointment.